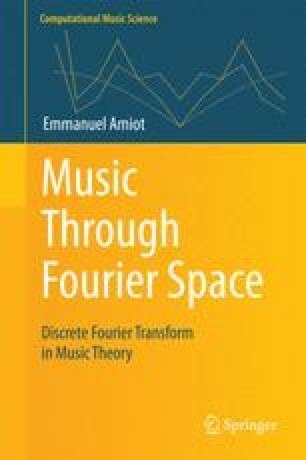 This chapter gives the basic definitions and tools for the DFT of subsets of a cyclic group, which can model for instance pitch-class sets or periodic rhythms. I introduce the ambient space of distributions, where pc-sets (or periodic rhythms) are the elements whose values are only 0’s and 1’s, and several important operations, most notably convolution which leads to ‘multiplication d’accords’ (transpositional combination), algebraic combinations of chords/scales, tiling, intervallic functions and many musical concepts. Everything is defined and the chapter is hopefully self-contained, except perhaps Section 1.2.3 which uses some notions of linear algebra: eigenvalues of matrices and diagonalisation. Indeed it is hoped that the material in this chapter will be used for pedagogical purposes, as a motivation for studying complex numbers and exponentials, modular arithmetic, algebraic structures and so forth. The important Theorem 1.11 proves that DFT is the only transform that simplifies the convolution product into the ordinary, termwise product.